There were 17 matches on the schedule in Doha on Tuesday and only three of them went the distance. Today was a crappy day at work and I didn’t get to watch much tennis so no Set Points for Tuesday. Instead, since I am excited about Wednesday’s schedule, I am debuting a new sweeping day preview picking out some of the top matches. I’ve had a lot of comments about my predictions. I’m not going to be doing the prediction pages for now – a lot of work for me and got fed up with them at the end of last year. I still want to share my opinions on matches and hope to do that from time-to-time on the main page. While both players have dropped in the rankings from their top ten heydays, this still feels like a big match-up. Interestingly, Radwanska has won their last three clashes including most recently in New Haven back in 2016 for the loss of just two games. 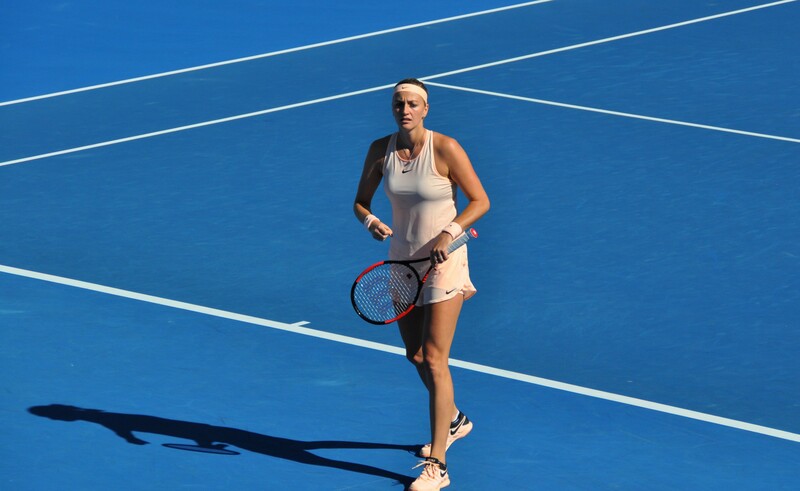 Kvitova dropped just four points in a sensational opening set against Cagla Buyukakcay, eventually winning in straights, 6-0 6-3. I feel like the newly blue Doha courts are quick (just me?) and a good surface for Kvitova. After watching Radwanska struggle past Mona Barthel, I can’t really see her challenging Kvitova unless the Czech player has an off day. It’s an indication of how strong Wednesday’s line-up is that a first time meeting between Americans, Madison Keys and CiCi Bellis, is out on the third court. I’m very intrigued to see how Bellis holds up against Keys’s power. Keys is looking mighty fine so far this year and my feeling is that she will come through in straights. Two of my favorite players to watch on tour and who always bring something different. This is a classic WTA hipster match! Niculescu seemed to be injured at the start of the year but is having a superb week in Doha having dropped just six games through qualifying and then beating Maria Sharapova in three gruelling sets. As much as I like Rybarikova, I did expect her to tail off after her Wimby semi-final. This hasn’t really been the case as she continues to pick up wins and took advantage of a favourable draw to reach the last 16 of the Australian Open. Close to 50-50 on this one, worth tagging at least as an upset alert. I’ll go with Magda. I was super impressed by Naomi Osaka on Monday night so i’d fancy her to score the upset when she plays the number 13 seed, Anastasija Sevastova on Tuesday. I also think the number six seed, Jelena Ostapenko could be in trouble up against Mihaela Buzarnescu in the last match on Centre Court. Buzarnescu has been a winning machine of late and while many of those successful results have come on the ITF tour, she has begun to translate that onto the WTA tour. Ostapenko has made an unconvincing start to 2018 and seemed to be injured during Fed Cup action in Estonia last week. The Latvian player posted about a nightmare journey to Doha where her flight was cancelled. It’s hard to know where Simona Halep will be health-wise after an incredible AO. Ekaterina Makarova is always a dangerous opponent. I’m also fascinated to see how Marketa Vondrousova gets on against the number three seed, Elina Svitolina. I would tag that as an upset alert but Svitolina has done a good job at getting through these dangerous early clashes. I’ve been proved wrong on more than one occasion so I happen to think she will prevail. As well as Rybarikova-Niculescu, i’m on the fence with the match between the number nine seed, Julia Goerges and Barbora Strycova. Aside from the AO, Goerges has been in red hot form. Strycova though is rather quietly building a strong start to the year and has won their last four encounters, three of which were on hard courts. Garcia and Mladenovic on course for a frosty encounter. Caro was mighty impressive against Cibulkova. There was a slight lapse closing out the second set but Domi really fought hard to level it up. I didn’t expect that third set, impressive indeed from Garcia. I do hope we get Mlads-Garcia next! I do hope Garcia wipes the floor with Mladenovic if it happens. I think it could go either way, either Garcia will let it get to her mentally or she’ll use it as motivation to win, as she did with Cornet at the French. Yes I would be rooting for Garcia. Not a clue how that one would pan out, Mladenovic seems to be back to form after the long losing streak. Well I may be biased but I don’t see any argument for Mladenovic being the better player, although she obviously wins the net game aspects. I think the Garcia forehand is cleaner and more technically sound, her serve is more reliable and versatile, and her backhand is more stable than Kiki’s; it’s lethal when it’s really on song. Garcia plays with controlled aggressive these days, and if she sticks to that then she can’t really lose. Oh my, not going to happen anyway! Another good win for Anna Blinkova. Very promising start for Svitolina, almost no rust from the short break/injury. Maybe more errors than usual and her first serve percentage wasn’t as great, although it did improve as the match went on. Slightly unrelated but has Svitolina employed some stylists? She’s always been pretty but somewhat mousy. She’s looking STUNNING this year though! Her sponsorships are definitely going to get her $$$. The Moo calls it again ( someone to watch ). Qualifier Blinkova(#164) def Vesnina(#23) and Mladenovic(#13).